It would seem that Led Zeppelin's success in the early 1970s would have made the coming of a band like Heart inevitable. Similar to how Kiss made the gender-bending confusions of glam rock safe for American children by making themselves into cartoon monsters instead of faux transsexuals, Heart would seem to have made the overt feminization of hard-rock machismo embodied by Plant and Page safer for teenage male consumption by putting actual hot chicks (in this case, Ann and Nancy Wilson) in the place of the wispy long-haired men the boys were likely lusting to be (and, unconsciously, to have). But this substitution automatically undermined the band's authority; if boys could openly desire to have the women in the band, then they couldn't simultaneously respect them and want to be like them -- that is, worship them. And the presence of palpable female sexuality was probably much too threatening for boys to handle anyway. In that paradoxical teenage universe, it's manly to be a fanatic for shirtless men in tight pants but suspiciously wussy to like a band with girls in it. In truth, Heart borrowed much of their approach from Aerosmith, the first American band to copy Zeppelin. The favor was later repaid, when Heart became pathfinders for Aerosmith's abhorrent post-career career as schlocky Michael Bolton balladeers with their 1985 "comeback", which contained the bathetic anthems "What About Love" and "These Dreams". Regardless of what horrors their later career would unveil, the allure of Heart's first and best album, Dreamboat Annie, was undeniable. It included two of the greatest FM-rock-radio songs ever recorded, the sublime, suite-like "Magic Man" and the positively lordotic "Crazy on You." The warm blend of guitars, equal parts primitive riffing and pyrotechnic fret-board trickery, and Ann Wilson's throaty vocals, just as powerful whether she's warbling like a minstrel or shrieking like an unhinged harpy, were both perfect for the medium; they both could cut through engine noise and wind through open windows to sound great on a car stereo. And though the sexuality was submissive and men were depicted as mythical sensual superheroes, there was still something revolutionary for the genre about these songs, which shamelessly proclaimed female lust, and took for granted the normalcy of female libido while fleshing out the human being behind such feelings. Most hard rock, if it acknowledged the existence of women at all, only did so to assure its insecure audiences of their one-dimensionality, of their being inexplicably cruel heartbreakers or compliant sexual objects. The advent of Heart seemed to promise a correction, with women evincing confidence and command, entirely comfortable with leading a rock band and expressing the female point of view. 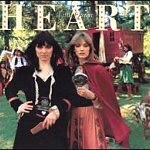 But on subsequent albums, Heart never really followed through with that. Instead the band was satisfied with playing methodical, journeyman-like boogie rock with occasional renaissance-festival overtones. Just check the cover of Little Queen, where the Wilson sisters are in full gypsy regalia (Nancy even holds a crystal ball) and the rest of the band sport accoutrements like leather chaps and crossbows. While this album does include "Barracuda," the stutter-riffed harmonic-hooked killer which completes the triumvirate of massive Heart rock classics, the rest of the album drifts a bit aimlessly. Record-company disputes forced the band to include some of the material destined for this album on Magazine, and you get the feeling this record had to be padded out as a consequence. Exhibit A: the introduction of the mandolin-heavy, "Battle of Evermore" wannabe "Dream of the Archer" is listed as a separate track, "Sylvan Song". Exhibit B: the refusal to fade out the underwritten title track, allowing it instead to plod on to a five-minute plus running time. Exhibit C: the closing two tracks, "Cry to Me" and "Go On Cry", betray exactly the lack of imagination their titles suggest: the former is a generic ballad and the latter is essentially an instrumental jam outro. But there are highlights: "Love Alive" has an ambitious arrangement that works, and calypso experiment "Say Hello" is surprisingly winning, sharing some of the exuberance and carefree spirit of the early Sweet singles. A live version of "Stairway to Heaven" included on this reissue is an interesting curiosity, worth hearing once. But far more typical of what was to come is "Kick It Out," a rote rocker with trite lyrics that read like a string of non sequiturs, on which the band seems as blandly efficient as a cash machine. The production is pristine and the band's chops are unquestionable, but the results are uninspired. One senses that inspiration gap even more strongly on their next record, Dog & Butterfly, whose half-baked songs are unnecessarily long with predictable changes and a conspicuous lack of hooks. Often the band settles for one cut and dried riff, where several married together might have produced something compelling. Instead, the album is a true relic of corporate rock's heyday, before punk had any real impact on America, at least at the level of midwestern radio stations and Listening Booth stores, when music was still meant to sound professional. Dog & Butterfly sounds professional through and through, but it's organized around the dubious concept of separating out their dreamy, ballad side from their more guttural, aggressive side. So side one is bluesy (in a Blueshammer sort of way) and riff-heavy, while side two is languid and ethereal, with lots of slowly strummed guitars, arpeggios, and overdubbed orchestral elements. But part of what made their early hits so brilliant was how they blended acoustic and electric guitars and balanced heavy and soft elements in the same song: think of the opening of "Crazy on You," the way the lick barrels over the open acoustic chords, or think of how Ann's voice goes from pleading desperation on the bridge to fiery testifying on the chorus. With its artificial bifurcation, nothing on Dog & Butterfly approaches that kind of soaring seamlessness. But a larger problem is that Heart really has nothing to say: no ideas animate these songs, and you get the dismaying feeling that nothing motivates them except the stipulations of their recording contract. Despite Ann Wilson's being in fine voice, she just has nothing interesting to sing. Where their somewhat unique status as a female rock band might have generated some fresh, insightful material, Heart seemed to deliberately shy away from anything that might have been interpreted as subversive, sticking instead to banal tropes: "High Time" and "Cook with Fire" are about as exciting as those cliches would lead you to expect, and even the album's hit, the simmering "Straight On," is a bit methodical. "Mistral Wind" eventually builds up a head of steam, but only after its squandered a patient listener's good faith with a ponderous opening section. Only the title track transcends the middle-of-the-road blandness, largely because there's something campy about how earnestly they try to put across the young-girl-emerging-from-her-chrysalis shtick. Regardless of its flaws and merits, Dog & Butterfly certainly captures Heart voluntarily experimenting with their established style in a way they felt comfortable with. The same can't be said of their next album, Bebe Le Strange. By 1980, bands like Heart had come to be seen as arena-rock dinosaurs, forcing many to respond with new-wave inflected albums pitched at varying levels of desperation. Some of these were brilliant reinventions (Fleetwood Mac's Tusk), others were awkward revelations of how tenuous the grasp can be on one's own identity (Linda Ronstadt's Mad Love). Bebe Le Strange is certainly awkward, but that's not due to stylistic stretching but to their effort to have it both ways, to have Zeppelin vamps like "Down on Me" (not to be confused with the Janis Joplin roof-raiser) coddled aside pulsing, staccato tracks like "Break". Some of it feels as underwritten as Dog & Butterfly, (there's the by-now-standard Nancy Wilson vanity instrumental, "Silver Wheel", tossed in), but the greater attention to detail apparent on the new-wavy numbers makes it feels like a bit more was at stake. The guitars are given a dry treatment, sometimes with a belchy chorus effect added, and they are as likely to fly into discordant (i.e. "edgy") runs of notes and atonal screeching as they are into familiar soloing patterns. And while Wilson sounds a bit silly when she's tries to twist her misty-mountain banshee wail into something like a bratty Missing Persons squeak, there's less posturing in her voice overall -- she sounds loose and comfortable on the Stones knockoff, "Even It Up" and the title track, but no amount of vocal charisma could have rescued "Raised on You," a schmaltzy, bouncy piano tune worthy of Billy Joel. But as liberating as their experiments might have proved to be, Heart was unwilling to risk anything that might dislodge the band from its comfortable perch as the female face of corporate rock. When the spirit of the times turned against the mass-produced culture-industry product at the turn of the decade, for that very brief moment, for example, when a yet-to-be-co-opted MTV opened a new audience's eyes and ears to a vast eclectic array of innovative music, Heart was without their sales niche. After this record, they would go underground commercially for a few years, only to return, stocked with the best, most homogenous and emotionally reductive songs an army of music-industry songwriting hacks could contrive and armored in corsets and coiffed with enormous. hairstyles for glitzy, deliriously excessive videos, to reclaim their throne when corporate rock yet again emerged triumphant.